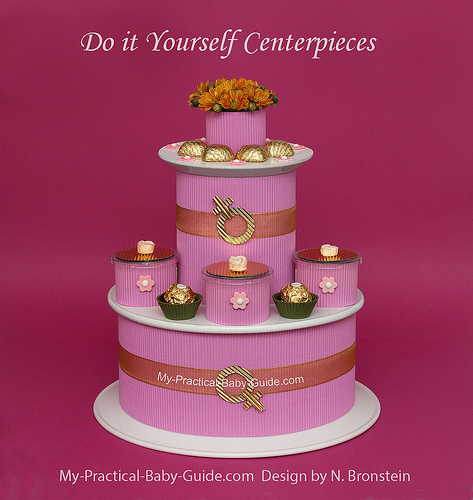 A timeless three tier centerpiece for a girl baby shower in the traditional pinks with touches of gold and greens. We added the symbol of the gender as a decoration. The limited but well balanced colors make a simple yet stunning centerpiece. 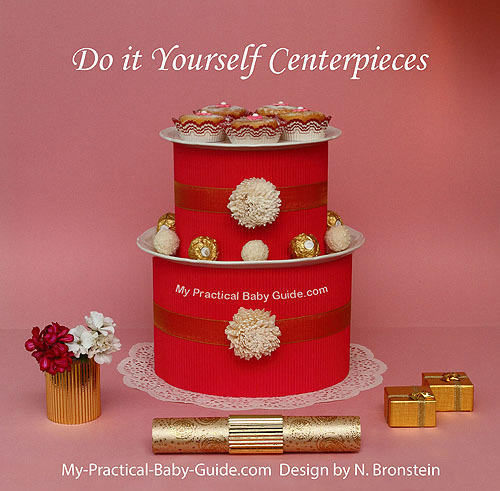 The materials used: White plates of various sizes, a white footed plate, a wavy/corrugated paper, a translucent ribbon, sugar decorations, olive green silicone cupcake molds, clear plastic favor boxes, candies and flowers. The plates can be found in every home, the flowers can be picked from the garden or be bought at your local store, the paper is inexpensive about one dollar per sheet which is all you need. 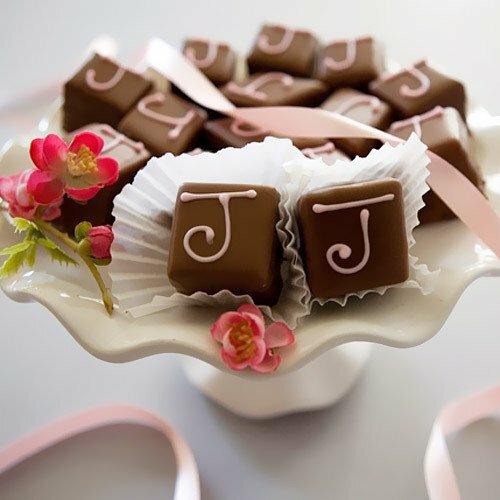 The ready made clear plastic boxes used for the favors cost very little as well, all you have to do is to cover them with stripes of the same wavy/corrugated paper. The suggested color for the ground is a light pink. You can either use a light pink tablecloth or a light pink runner over a white tablecloth. The runner can be made of Canson paper as in the picture or, of Dupioni silk if you wish to create a more luxurious look. Our suggestion for the table setting: If you use a white tablecloth you can use white plates with subtle red decoration and dusky pink napkins. If your tablecloth is light pink, white plates and white napkins will look great. You can enhance the look of the setting by adding little bowls covered with stripes of the metallic gold wavy/corrugated paper. You can use the bowls to serve salads, sweets or anything that goes with your menu. This centerpiece looks as lovely in reality as in the photo. 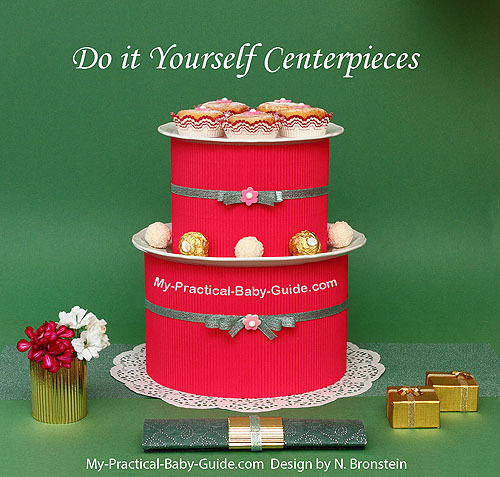 Another centerpiece suitable for a girl baby shower in magenta, light pink, cream and touches of gold. 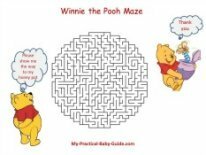 Economical and extremely simple and quick to make. The materials used: Ordinary cream plates, a matt, magenta wavy/corrugated paper, a metallic gold wavy/corrugated paper, a translucent gold ribbon, a cream paper lace cake circle, cream dried flowers, sparkle gold paper, paper towel rolls, white and red paper cup holders, candies and cupcakes. The suggested color for the ground is light pink. You can either use a pink tablecloth or a pink runner over a cream tablecloth. The runner can be made of Canson paper as in the picture or of Dupioni or any other silk if you wish to create a more luxurious look. Our suggestion for the table setting: A light pink tablecloth with cream plates and cream napkins will look great. 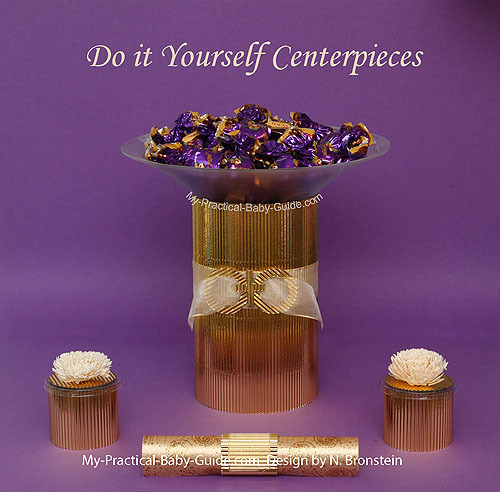 You can enhance the look of the setting and harmonize it with the centerpiece by adding little bowls covered with the metallic gold wavy/corrugated paper. You can use the bowls to serve salads, sweets or anything that goes with your menu. You can also make narrow strips from the wavy/corrugated gold paper and create rings to hold the napkins. The two cream dried flowers were found in a bag of pot pourri. 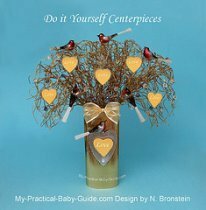 You can use any similar ready made or hand made products as substitute or even fresh Carnations. 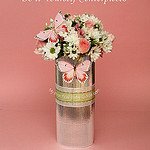 The favor box in the front is made from a paper towel roll. 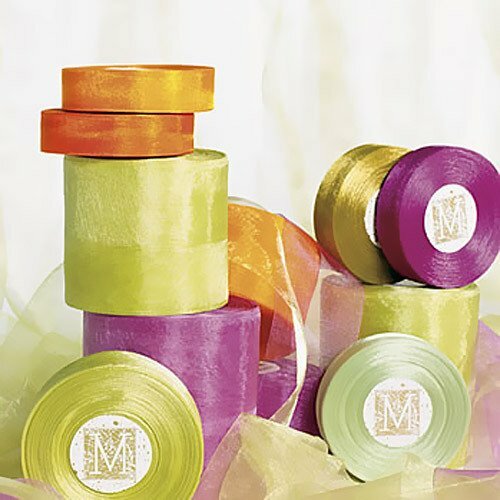 Save these rolls and wrap them with gorgeous sparkle gold paper available in craft stores. This paper may be too expensive for big quantities so if not suitable, use cheaper substitute that can look just as striking. 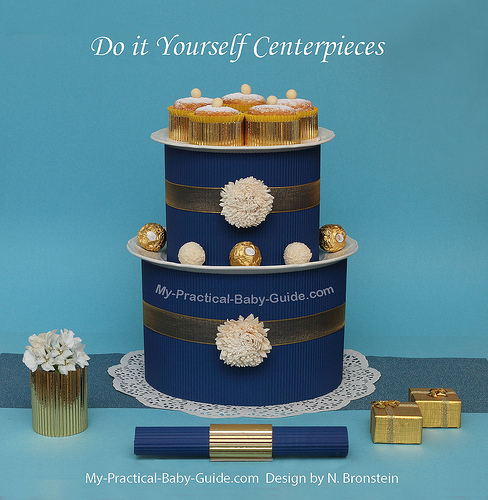 A three tier centerpiece for a boy baby shower in the traditional, timeless blues with touches of gold and greens. Economical, quick and easy to build and assemble. We used the gender symbol for decoration. The limited but well balanced colors make a simple yet striking centerpiece. 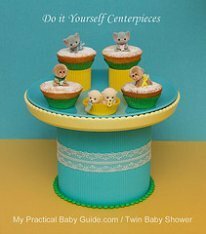 The materials used: White plates of various sizes, a white footed cake plate, a turquoise/blue wavy/corrugated paper, a translucent gold ribbon, sugar flowers, olive green silicone cupcake molds, clear plastic favor boxes, candies and flowers. The plates can be found in every home, the flowers can be picked from the garden or bought at your local store. The wavy/corrugated paper is inexpensive and costs about one dollar per sheet which is all you need. 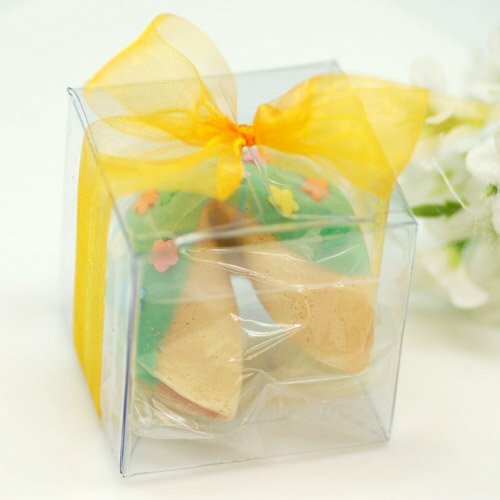 The ready made clear plastic boxes used for the favors cost very little as well, all you have to do is to cover them with stripes of the same wavy/corrugated paper. The suggested color for the ground is a light turquoise/blue. You can either use a light blue tablecloth or, a light blue runner over a white tablecloth. The runner can be made of Canson paper as in the picture or of Dupioni or any other silk if you wish to create a more luxurious look. Our suggestion for the table setting: If you use a white tablecloth you can use light blue plates with light blue napkins or white and blue plates. If your tablecloth is light blue, white plates and white napkins will look great. You can enhance the look of the setting and harmonize it with the centerpiece by adding little bowls covered with the metallic gold wavy/corrugated paper. You can use the bowls to serve salads, sweets or anything that goes with your menu. 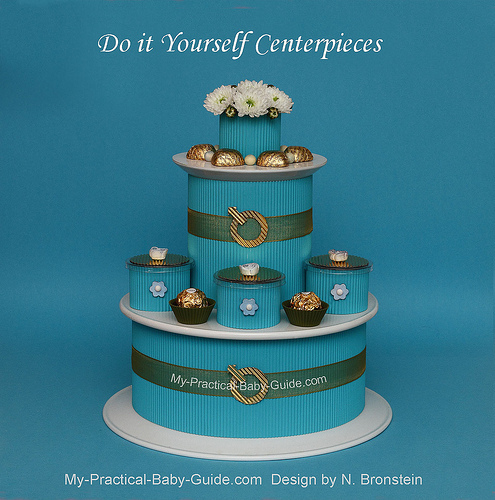 Another centerpiece suitable for a boy baby shower in light blue/turquoise, dark blue, cream and touches of gold. 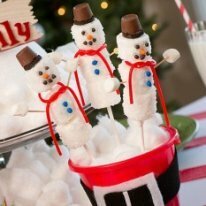 Economical and extremely simple and quick to make. 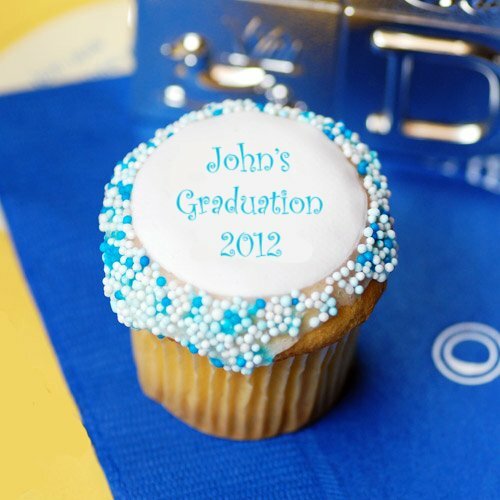 The materials used are ordinary cream plates, a dark blue, matt, wavy/corrugated paper, a metallic gold wavy/corrugated paper, a translucent gold ribbon, a cream paper lace cake circle, cream dried flowers, paper towel rolls, yellow paper cup holders, candies and cupcakes. The suggested color for the ground is a light blue/turquoise. You can either use a blue/turquoise table cloth or a blue/turquoise runner over a cream tablecloth. The runner can be made of Canson paper as in the picture or, of Dupioni or any other silk if you wish to create a more luxurious look. Our suggestion for the table setting: If you use a cream tablecloth you can use light blue plates with light blue napkins. If your tablecloth is light blue, white plates and white napkins will look great. The favor box in the front is made of a paper towel roll. Save these rolls and wrap them with matt, dark blue and metallic gold wavy/corrugated paper. 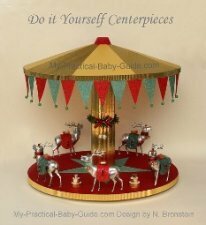 For a tutorial on how to make this centerpiece please follow this link.